Every town has that indomitable restaurant where you know the cuisine will always impress, and you’re bound to run into a friend at the bar. In Blowing Rock, that place is Crippen’s, and the friend that’s always around is the ever-gregarious owner Jimmy Crippen. Though this local institution, set in the main floor of this country inn, pours gloriously sweet and refreshing cocktails with playful names like Rang Around the Rosy and Ginger Spice, the cuisine is what garners awards. Think Chocolate Steak—but we’ll get to that soon enough. Our meal begins with an outstanding sweet-vermouth, toasted-almond portobello soup, rich with essences of the forest. Then, the bittersweet chocolate-infused, espresso-encrusted grilled beef tenderloin illustrates Chef James Welch’s playfulness in the kitchen. The rich meat is served with pistachio goat cheese au gratin and French beans. 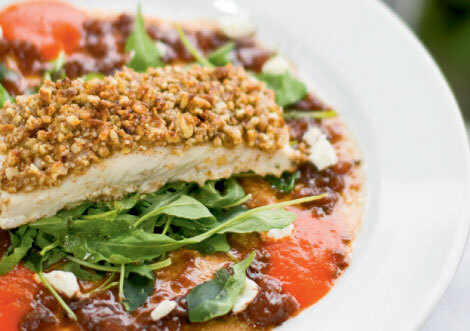 Perhaps even more delicious is the pecan-encrusted Alaskan halibut over wilted, organic arugula with goat cheese, marked by a tangy fusion of roasted red pepper coulis and tomato balsamic vinaigrette. This plump, well-seasoned filet is moist with the slightest golden crust. For dessert, the Warm Chocolate Decadence, molten lava cake with white chocolate anglaise, is a favorite among regulars. But for this summer’s eve, I choose the house-made honey and cinnamon ice cream—at once velvet and satin on the tongue. It’s so good you may just book a room upstairs to eat here again the next night. Before you check in, stop at the bar; the Basil Gin Gimlet makes a great nightcap.